For years, governments across Latin America have focused on improving labor market outcomes for young workers. To achieve this goal, governments have tried a variety of policy tools including state-funded employment services, job training programs, subsidized internships and the continued expansion of tertiary education (Vezza 2014, Urzua et al. 2016). However, the existing evidence on the patterns of earnings growth for young workers and the factors behind this growth might challenge this approach. Are public policies in the region really confronting the needs of the new cohorts of workers? To answer this question, one must understand what labor markets demand from young people. Consider two scenarios: in the first, labor markets value more the workers who accumulate years of experience (they demand human capital that can be transferred across different firms). In the second, labor markets value more the workers with firm-specific capital, those who accumulate more years of tenure. Which scenario do we face? Is tenure more important than experience or vice versa? Theoretically, economists have argued that tenure should be a major driving force behind earnings growth. Becker’s (1964) model of investment in specific human capital predicts that wages rise with job tenure, whereas Becker and Stigler (1974) and Lazear (1981) argue that firms implement deferred compensation to encourage worker effort, giving rise to upward sloping wage-tenure profiles. Mincer and Jovanovic (1981) and Topel (1991) provided early cross-sectional evidence evidence showing large returns to firm tenure, though these findings were subsequently been questioned (Altonji and Shakokto 1987). In a review article, Altonji and Williams (2005) concluded that both experience and tenure are important contributors to overall earnings growth, so the answer, at least among developed countries, is ambiguous. Nevertheless, given the structural differences across labor markets, the evidence from developed economies cannot be directly used in Latin America. Moreover, the analysis of career progressions of (young) workers has traditionally relied on administrative data capturing the individual-level evolution of experience, tenure and earnings. Such data has not been historically available for countries in the region, until recent years. In Martínez, et al. (2017) we provide new evidence shedding light on this issue. We take advantage of matched employee-employer administrative datasets for two of the largest economies in the region, Brazil and Chile. These databases include information on labor market outcomes for the universe of formal sector workers in these two countries, including monthly earnings, accumulated experience, tenure, industry of employment and various worker-level observables. The data allows us to track the trajectories of young workers in the labor market and capture accurate information on various labor market outcomes. Our empirical strategy introduces an econometric framework, which allows us to estimate the relative contribution of experience and tenure in these two countries. To the best of our knowledge, this is the first analysis to compare worker outcomes across two countries using administrative data. To develop comparable insights across the two countries, we restrict our analysis for workers born in 1983-84, for whom we observe their labor market trajectories from entry through age thirty. We normalize the measures of experience and tenure and focus on monthly earnings in US dollars, and further restrict our analysis to workers who remain employed in the formal sector, to ensure they do not accumulate informal sector experience. Figure 1 shows the evolution of monthly earnings for workers in the 1983-84 cohort across the two countries, showing significant growth in the early years of their career. To ensure this pattern is not driven (solely) by the region-wide commodity boom, Figure 2 shows that young workers experience significant additional growth during 2003-2012 relative to the growth experienced by workers in the 1963 cohort. In short, we first show that young workers who remain employed in the formal sector in both Brazil and Chile experience significant growth in earnings early in their careers. Our descriptive analysis shows that the earnings of young workers more than double in the first decade in the formal sector both in Brazil and Chile. Nevertheless, these two countries have significantly different labor market institutions. 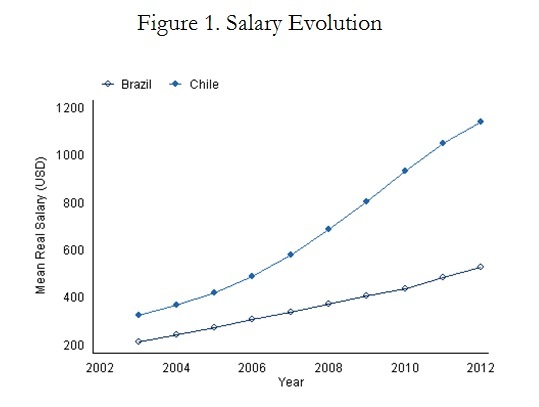 Specifically, while Chile’s labor market can be described as flexible, with low firing and hiring costs, Brazil has a large minimum wage, extensive hiring and firing restrictions and various limits on short-term contracts (Heckman and Pages 2000 and Corseuil et al. 2015). Thus, different factors could be driving the observed growth. For example, firms in Brazil should have stronger incentives to invest in firm-specific capital for young workers and similarly, workers will have limited incentives to voluntarily quit their jobs, given the difficulty of finding new matches in a regulated labor market (Acemoglu and Pischke, 1999). If so, the design of labor market institutions indicates that the returns to tenure should be larger in Brazil than in Chile. To evaluate this hypothesis, we implement the empirical strategy in Dustmann and Meghir (2005). We estimate the returns to tenure relying on the job spells of workers who have been displaced from their jobs during plant closures and mass layoff events, thus allowing us to exploit exogenous changes in tenure. However, since post-displacement participation and accumulated experience remain endogenous decisions, we implement a control function approach disentangling the returns to an additional year of experience or tenure. Main results. Figure 3 presents the results from our estimation. In Brazil, on average, the first year of experience for a young worker results in a 5% increase in her monthly earnings. However, accumulating additional experience in future years brings about no additional returns. On the other hand, an additional year of firm-specific tenure results in significant earnings increases, even for workers who have already spent three years employed in the same firm. 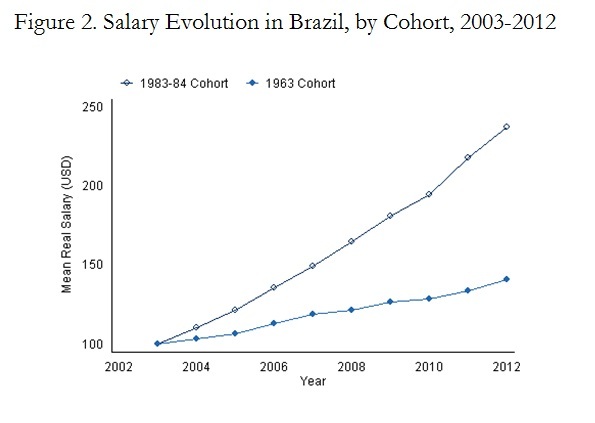 This result confirms the intuition presented above: given strict labor market regulations present in Brazil, the increase in earnings in the early career is explained by workers who accumulate tenure at the same firm. For Chile, the story is different. As the results in figure 3 (panel B) show, workers do not enjoy positive returns to additional year of firm-specific tenure, regardless of their accumulated tenure. Meanwhile, the increase in earnings can be largely explained by large returns to experience: a worker who has been in the labor force for one year should expect an increase in earnings in the range of 20 percent, and these returns remain positive even for workers who have already accumulated five years of experience. These results can also be explained in the context of a flexible labor market, in which workers can easily move across firms and thus increase their monthly earnings by accumulating overall experience in the labor market. All in all, our results —large returns to experience in Chile and to tenure in Brazil—, highlight the importance of not only the first few years of the career of young workers but also how labor market regulations can shape their progressions. In light of our findings, the answer to the question that increasingly concerns Latin American governments —what is the best strategy for improving labor market outcomes among young workers? — must be considered within each country’s labor market institutional frame. One policy does not fit all.